Join us in raising the Pride Flag at City Hall! This is our second year raising the flag for the full month of June. Join us for an extremely special and meaningful event, as members of the LGBT2S+ community and allies come together to share stories, songs, and food! A great way to wrap up a busy Pride weekend! Join us for wine and appies in the beautiful gardens of Kendall House B & B. This event is generously sponsored by Kendall House Bed & Breakfast and Juliana's Wine Boutique. Join us for an afternoon in the beautiful gardens at Kendall House (127 5th St. S) for wine, food, and sharing with good company. Featuring wines generously donated by Juliana's Wine Boutique. Allies and supportive friends and family welcome. Wine, cheese, and appetizers provided. This is a FREE, age of majority event. Join us in the gym at Knox United Church at 1pm for a Powwow Styles Dance Teaching with Waawaate Fobister! Water and light refreshments provided. Join us for Pride Worship at Knox United Church, an Affirming Congregation. 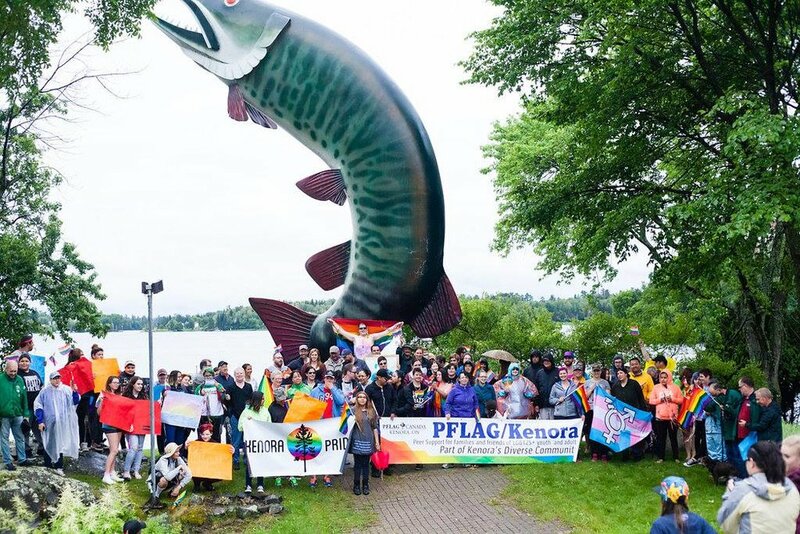 Knox has been a longtime supporter of Kenora Pride, as well as many other LGBT2S+ initiatives in Kenora. Everyone is welcome at this event. Stay tuned for more info about special guests! Tea, coffee, and muffins will be served before and after the service. Join us for our annual march, beginning at the Lake of the Woods Museum and ending at Husky the Muskie! Stay tuned for more info about this year's special guest speakers. Written and performed by Waawaate Fobister. Agokwe explores unrequited love between teenage boys from neighbouring reserves. Mike is a hockey player and Jake is a traditional dancer. The boys notice each other at the Kenora Shoppers Mall and ultimately connect through a mutual love of movement while Mike is skating and Jake is dancing “like grass blowing in the wind.” They meet briefly at a post hockey-tournament party where they bashfully confess their desire for each other. However – youth, distance and isolation strive to pull the threads apart when tragedy intervenes. AGOKWE speaks to bullying, homophobia, unrequited love, social isolation and the lost traditions of the Anishnaabe. Join us for our annual Pride BBQ at Anicinabe Park from 11 AM - 1 PM. Like all of our events, this event is absolutely FREE. Come as you are. We will be serving burgers, hot dogs, and cake! 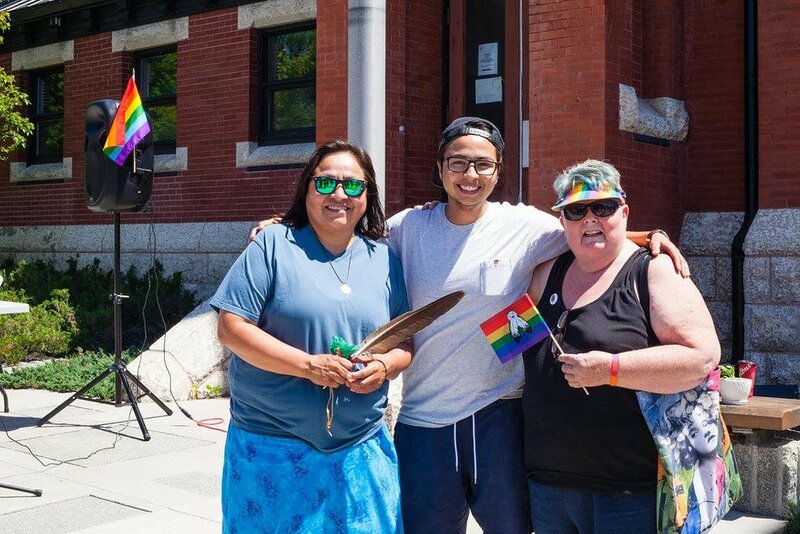 We will also have sign making for the Pride March, sponsored by the Canadian Mental Health Association - Kenora Branch. Stayed tuned for more info on fun activities during the BBQ! Presented in partnership with SPACE Kenora and the Kenora Association for Community Living. Join us for an evening of stories, music, and sharing. Everyone is welcome to share, and we are also accepting submissions of art and photography to be displayed in the space. If you have something to share but don't feel comfortable, you can submit anonymously and a volunteer will read for you. This is a FREE, all-ages event. Sponsored by the Lake of the Woods Brewing Company! This event is part of a monthly series of LGBT2S+ dance parties! Located in the Whiskey Lounge, upstairs at the Brew Co.
A safe place for those who colour outside the box to meet, mingle, dance and discuss. $4 drink specials and appies donated by the Brew Co.
All ages welcome until 10 pm! Kenora Pride is excited to announce our first event of of Pride season! We will be raising the rainbow flag at City Hall and keeping it up for the entirety of Pride Month! Also keep an eye out for the Transgender flag flying above the Northwestern Health Unith. This event will feature local speakers, Pride merch, and more! Hope to see you there!